Journey into the depths of Sherwood Forest with this toe-tickling tale of tights, fights and footlights! Journey into the depths of Sherwood Forest and discover the hilarious truth behind the legend of Robin Hood in this brand new musical comedy! The curtain rises on our poetic playwright and narrator Billy Wigglestick, who sets the scene, introduces Maid Marion and cues the energetic opening number, "Sherwood Forest". We meet the villagers of Sherwood, including Marion's over-protective guardian Nursie and her short-sighted nephew Will Scarlet. Through some humorous banter we discover the villagers' dislike for King John and the Sheriff of Nottingham, and Marion urges her neighbours to help her stand up to them. The Sheriff arrives, flanked by his gang of gormless guards, and proclaims that all taxes are doubled. Despite the villagers' complaints, Marion's insults and Nursie's "charm", the Sheriff cannot be dissuaded and demands his money by noon before sweeping off, followed by his men. Unable to pay, the villagers sadly prepare to move out. Nursie and Will discover an advert in the local newspaper for The Merry Men - a team of highly trained professionals - and Marion decides to send an urgent letter to hire them immediately. Nursie calls her troupe of young scouts (known as the Skunks) to help track down the heroes and deliver the letter, which they happily agree to do and all sing "Helping Hand". The action moves to Robin's camp, where we discover the Merry Men in an energetic fight scene. However, it soon becomes apparent that they are actually rehearsing for their latest show, for they are not soldiers but a troupe of wandering entertainers! Robin, the over-acting actor, Big and Little John the comedy ventriloquist act, Friar Tuck the mysterious magician, Much Muscles the hairy strongman, Alan A Dale the eloquent musician and the ever shimmying Dancing Dave of Doncaster. We learn that their bookings have dried up, so they are delighted when the Skunk Scouts arrive with Marion's letter explaining that she has some visitors coming at noon and needs the help of the Merry Men to give them "a welcome they'll never forget". Excited at the prospect of performing in front of a live audience once again, they sing their show-stopping signature song "Men In Tights". Our barmy bard Billy Wigglestick returns to introduce us to Nottingham Castle and the evil King John who is sat on his throne, petulant and depressed at his poor popularity rating in the press. In an effort to lighten his mood, the Sheriff summons the overly cheerful dungeon master Gavin and his strange assistant Genghis. They bring two prisoners, ridiculous robbers Grabbit and Bolt, and begin to torture them with ticklish feather dusters to amuse their sad sovereign. Their torture is short lived, however, as their comical flattery of King John persuades him to release them and make them the Sheriff's new henchmen. A reluctant Sheriff agrees and together they set off for Sherwood. Back in Sherwood, the Merry Men receive an enthusiastic welcome from the excited villagers. They are further impressed with their so-called 'heroes' when Robin declares that The Merry Men will slay their visitors in the aisles and knock them dead. Will Scarlet displays his dubious archery skills and his comically rebounding arrow eventually hits its target of a rubber chicken, much to the delight of the Merry Men who invite him to join their troupe. When Marion takes a closer look at Robin's business card, however, she finally discovers the terrifying truth about her new friends - just as the Sheriff arrives with his guards and henchmen. Robin introduces himself to the Sheriff and when his Merry Men suddenly appear, the surprised guards scatter in terror, swiftly followed by Grabbit and Bolt. The Sheriff attempts to escape but is stopped by Robin as Will enters with another display of his short-sighted archery. As the Sheriff cowers behind the villagers, Will's wayward weapon accidentally finds a new target and a dazed Sheriff emerges with the arrow stuck right through his head. He exits screaming, to the delight of the villagers and the disappointment of Robin and his gang. When Marion reveals the truth behind her mistake, everyone is shocked - not least the Merry Men, who realise that they have inadvertently become outlaws. However, Marion concludes that fooling the Sheriff is the way to win, and persuades Robin and the Merry Men to take on a new acting role - to become 'The Sherwood Hoodies', fighting for freedom, robbing from the rich and giving to the poor, led by their heroic leader Robin Hood. Instantly flattered, Robin agrees and all sing the rousing anthem "He Will Be A Hero". We return to Nottingham Castle where Gavin and Genghis inform King John of their new torture equipment, 'The Squisher', which rolls out prisoners until they are completely flat. When the terrified henchmen, guards and Sheriff return, King John is furious to learn of the gang of Hoodies who now protect the Sherwood villagers and he instructs the Sheriff to deal with these outlaws. The Sheriff tells Grabbit and Bolt to return to Sherwood as secret spies, capture Robin and "take him out". Meanwhile in the forest, Marion is directing her performers in their new roles as 'Sherwood Hoodies', robbing from the rich. They are hopeless heroes, however, and each attempted robbery collapses comically into chaos. The Sheriff has a secret meeting with Grabbit and Bolt and lends them his kidnapping kit in order to capture Robin, warning them that the outlaw may be in disguise. They spy Marion muttering to herself and believe her to be Robin in a devious disguise. Despite their incompetence, they eventually manage to kidnap Marion and take her back to Nottingham Castle. When the Skunks discover Marion's fate by cleverly deciphering the tracks on the ground, Robin declares that they must work together to rescue Marion and all sing "If We All Work Together". Back at Nottingham Castle, Grabbit and Bolt reveal their mistaken kidnap victim to King John and the Sheriff realises that, with Marion as bait, Robin will soon walk into his trap. As they leave to prepare, Robin and his rescue party arrive and split up to find Marion. After some comical creeping, however, our heroes are caught and dragged to the dungeon, where Gavin and Genghis are delighted to have new guests to torture in their Squisher. Robin and the Merry Men raise spirits with the uplifting song "Singing All Over The World"and, moved to tears, Grabbit, Bolt, Gavin and Genghis decide to release the prisoners. At that moment, the Sheriff enters to halt the escape - only to be knocked out by a quick-acting Will. The Sheriff stumbles into the Squisher and re-emerges as flat as a proverbial pancake. Relief is short-lived, however, as King John and his guards appear and threaten to execute Robin. Thankfully, before the axe can fall, Will enters for his final feat of anarchic archery and this time his arrow results in a painful surprise for King John - and quite a different surprise for everyone else! To seal King John's fate, King Richard makes a triumphant return to reclaim his throne, punishing the wrong-doers, honouring the Hoodies and awarding Robin with the accolade of his dreams - an Oswald statuette for Best Actor. A final poetic verse from Billy Wigglestick brings the story to a happy conclusion and a reprise of "Men In Tights" provides the show's spectacular finale! In the following list, the number shows how many spoken lines each role has. An asterisk (*) before the character's name indicates that this character ALSO has solo or featured sung lines. Please note that an Easy Play Score is also available. *These PDF files require a PDF reader such as Adobe Acrobat. "This is written in true panto style and I have seldom seen a professional panto which is more entertaining In the writing. This has practically a laugh a line and is very sophisticated and well written, considering it is a play written for children to perform. The adult audience loved it and also a 7 year old said she liked it so much she wanted to see it again, and was it on You Tube! The songs are great and I keep singing them.... I can even remember the ones from last year's "Pirates' of the Curry Bean" - Craig Hawes, we need more please!" 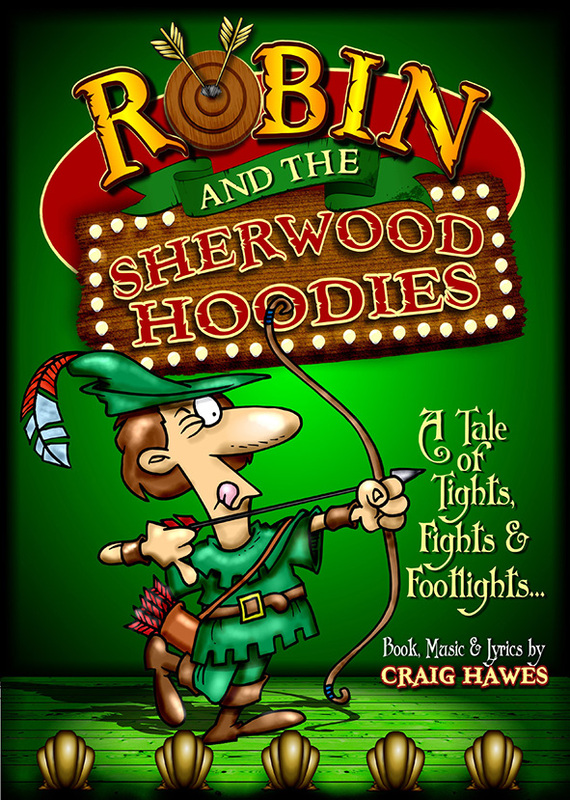 "We put on Robin and the Sherwood Hoodies this year and it was exciting, enjoyable, and entertaining. The pupils loved playing all of the roles because of the hysterical jokes. They adored the songs especially 'Singing All Over the World'. This song even had some parents in tears. We would definitely recommend this play to other schools." "A real joy to rehearse and perform - catchy songs and hysterical script made it non-stop fun for pupils and parents alike! I'm still singing the songs in the car!"